Media: Soft, glossy, colour covers; 21.5cm x 28cm portrait format, printed in black and white on 112 good quality, semi-gloss pages. Includes 20 pages of colour artwork by Richard J Caruana and many black and white, plus some colour, photographs. This is one of the few instances where I have bought a book without hesitation, having not already read a review first. Publishers Dalrymple & Verdun are new to me, but the sight of author Richard A Franks' name, familiar I am sure to modellers everywhere as a well known aviation author and modelling magazine editor, was enough to assuage any fears I may have had about the purchase. The book's format follows that of many recent titles, being just under A4 size and having soft covers. The latter are distinctive, in that the front cover is in an eye-catching, almost 'Pop Art' style, whilst the rear bears a more conventional full size photographic image. Printed on semi-gloss/satin pages, the main chapters are supplied with mainly black and white photographs, interspersed with some colour shots here and there, totalling 108 in all. These photographs are generally excellent, mostly showing the Sea Vixen in front line service and culled from a wide range of sources (many not published before). The text is reasonably comprehensive and follows the life of the Sea Vixen chronologically, from Ministry specification, through prototypes, service life and eventual second line/civilian use. Complimenting the photographs, there are some 20 pages containing over 50 colour side profiles and 4-view illustrations by Richard J Caruana, covering the aircraft both in squadron service and as trials aircraft, drones, target tugs, etc. Whilst I cannot comment on the accuracy of the majority of these schemes, I did notice a small error in the description of the upper surface colour of F(AW) Mk.2(TT)/XJ524 illustrated on page 82 (the Sea Vixen I hope to model myself one day), which describes it as 'speed silver'. As the main text in chapter six on 'Sea Vixen Colours' correctly states, it is actually 'Light Grey' (part of a hybrid scheme based on that carried by the Royal Navy's Canberra TT18's of the time). 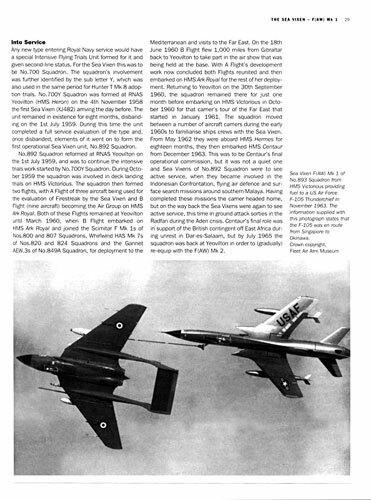 The story of the Sea Vixen is covered by the book in six chapters, with chapter one actually being about the DH.108 tail-less fighter project, the experience and data from which, De Havilland put to good use in the DH.110 prototype Sea Vixen described in chapter two. 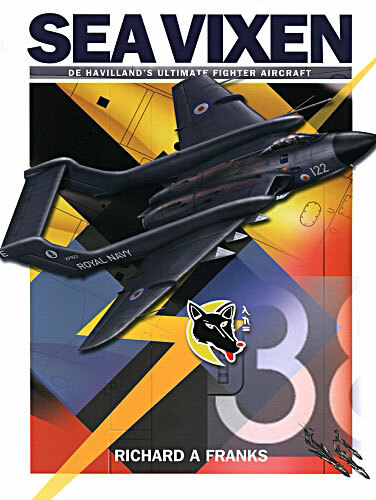 The remaining chapters cover; the F(AW) Mk.1, the F(AW) Mk.2, Second Line Service and then Sea Vixen Colours. There are also three appendices: Technical Data (including two cockpit, and one Observer's 'Coal Hole', photos); Sea Vixen Squadrons and finally, Sea Vixen Production (with a brief synopsis of each serial's life/fate). The book concludes with a single page on the 'Fred's Five' and 'Simon's Circus' Sea Vixen display teams, a Glossary & Bibliography page and an Index. Overall, this publication is tending towards being a modeller's, rather than an aviation historian's book, reflecting perhaps the author's background and remit. Whilst the text is very informative and useful, the photographs and colour profiles will probably be of most interest to prospective purchasers, particularly coupled to the information on aircraft colours and schemes in chapter six. Note that the book does not contain any service manual illustrations/diagrams, or scale drawings/plans. That aside, 'Sea Vixen - De Havilland's Ultimate Fighter Aircraft' seemingly rides the current wave of new books on aircraft of the Royal Navy/Fleet Air Arm and as such, it is a welcome addition to the existing titles. Modellers will no doubt be hoping that kit manufacturers also take note of the upsurge of interest in this area, and provide them with the means to do justice to these, up until now, largely ignored subjects. Review copy, courtesy of my financial exchange tokens holder (You mean 'Wallet' don't you? Wallet).